The health needs of newly arriving children and youth who are immigrants and refugees often differ from those of Canadian born children. The prevalence of disease differs with exposure to disease, migration patterns, living conditions, and genetic predispositions. Health care professionals, teachers, community workers and other citizens may be interested to know what some of the key preventable and treatable health issues are for immigrant and refugee children. 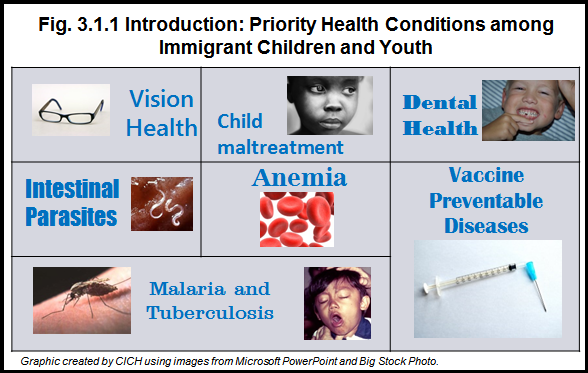 The priority health conditions among immigrant children and youth in this section were based on evidence-based guidelines developed by the Canadian Collaboration for Immigrant and Refugee Health. For a description of the methodology used to identify these conditions, click here. The Canadian Collaboration for Immigrant and Refugee Health (CCIRH), is a six year old interdisciplinary collaboration involving over 150 primary care practitioners, specialists, researchers, immigrant community leaders, and policy makers, that shines an evidence-based lens on the emerging new discipline of migrant health. CCIRH began with an ambitious project aimed at producing evidence based guidelines for primary care practitioners that cover a broad range of infectious diseases; mental health and physical and emotional maltreatment; chronic noncommunicable diseases; and women’s health; conditions identified by practitioners working with new immigrants.